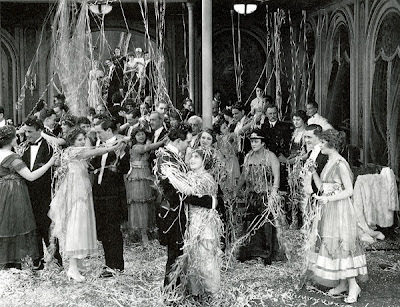 This post is part of Classic Movies’ Mary Pickford Blogathon, which is rolling right now. It’s important to know, before you slip a copy of this movie into your DVD player, or even read this post, that The Little American was directed by Cecil B. DeMille. Knowing this makes The Little American a more fulfilling viewing experience. It explains things. DeMille’s sort of a controversial figure in film history. He’s remembered as a director who put the public’s appetites ahead of its need for art—giving them what they wanted in the form of splashy, often hugely expensive films that were thin on insight. He directed a silent film about Joan of Arc (no, not that one); he made two versions of The Ten Commandments and the humbly titled Greatest Show on Earth (considered by some to be the weakest-ever Best Picture winner, though it’s not even close). When he died in 1959, DeMille was planning a movie about space travel. I wish he’d lived to make that one. It would have told us nothing about space, but an awful lot about what people hoped to find there. DeMille had a gift for recognizing the public’s desires and delivering a product that met them. Yet The Little American seems not to be an example of this. It seems, instead, an attempt to change the public’s collective mind—a tool designed to steel Americans’ resolve for a bloody conflict their country had just joined. The Little American was released less than five months after the U.S. entered the First World War. It stars Mary Pickford, then the absolute living embodiment of gutsy, fresh-faced American girlhood, as Angela Moore, a character who embodies the same qualities. By imperiling this character—at the hands of the Germans, upon whom the U.S. had declared war—DeMille made a far-off conflict seem more personal. Is The Little American a good film? Not really. This is a case where nuance and depth were not only absent, but, we suspect, actively discouraged. 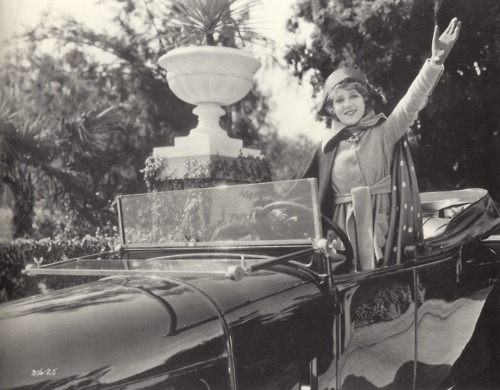 Pickford, a genius who spent most of her career elevating insipid material, is on auto-pilot here, and with good reason—it is vitally important that she be the very Mary Pickford audiences knew so well, so that those watching her might fear for her as one of their own. Pickford’s Angela is an American heiress born on the Fourth of July. 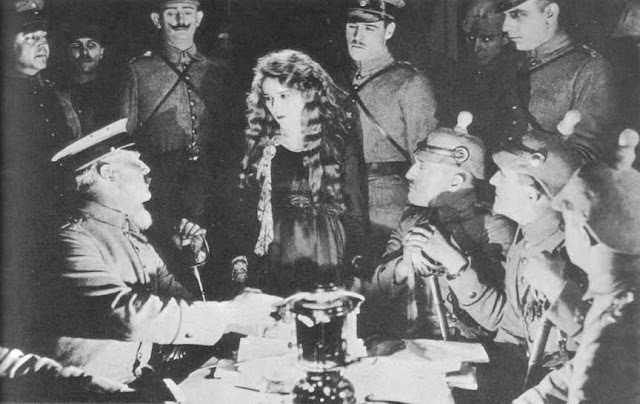 She’s a patriot; enough that her suitors, the Frenchman, Count Jules De Destin (Raymond Hatton), and the half-American, half-German Karl Von Austreim (Jack Holt), must ply her with red, white, and blue gifts. She favors the German, but he is called to war. Despite her best efforts, Angela is unable to maintain contact with him as hostilities rise overseas. The following year, Angela finds herself onboard a ship bound for France. She’s unconcerned about sailing into a warzone—she is, after all, an American citizen, and America remains a neutral power. Her ship, the Veritania (based on the real-life Lusitania) is soon torpedoed and sunk. Angela can’t believe that her citizenship affords her no protection. But this lesson will be hammered into her—and us—for the next forty minutes or so. In time she’ll make it to France, and to a dead relative’s mansion, now overrun by German soldiers. The soldiers “attack” the female servants of the household (we understand clearly what that word means) and shoot several local villagers. Angela is spared these fates, thanks to her past with the now-very conflicted German soldier, Karl. All she loses is her naïvete. I can’t imagine what effect the image of Mary Pickford being raped—or even the implication of it—would have had on an audience in 1917. It was probably hard enough for them to watch Angela Moore forced to her knees to scrub the muddy boots of a German general. This is all raw propaganda, with no hint of humanity displayed by any German character aside from Karl (who is, we’re told clearly, American on his mother’s side.) These elements of the film do work, though. The Little American is visceral and dark; punctuated by humor, but only momentarily, as befits its subject and more importantly, its greater purpose. But still, it’s a DeMille film. And watching a DeMille film isn’t supposed to be like going to the library, or to church; it’s supposed to be like going to an amusement park. The hottest looking Mary Pickford I’ve ever seen. If you know her work well, you’ll be struck by this. Pickford was 25 in 1917—in her physical prime, and of course, beautiful. But in this film, unlike so many others, she’s not playing a kid, a tomboy, or an over-buttoned, proper lady. Here she’s a little unkempt; a little sweaty; furtive, willful and passionate. There’s an undeclared but clearly visible eroticism to Angela Moore. So maybe, in one sense, this is not a typical Pickford role at all. Only DeMille would drop a spiced-up version of America’s Sweetheart into the middle of a propaganda film about war. It turned out to be my favorite part of The Little American. The Little American is available on DVD through Televista. A warning about this disc: it includes some of the worst music I’ve ever heard accompany a silent film. I muted these tunes more than once, and you should do the same. Your reading of how 1917 audiences would have received Mary Pickford in this movie says a lot about her star persona. She is one example of a star whose persona was inseparable from the filmtext - the film cannot be read without taking her star text into account. 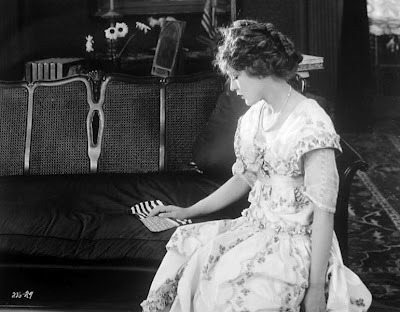 I hope you enjoy my post about persona (http://thegreatkh.blogspot.com/2012/04/introdution-word-about-persona.html) and let me know how you think it might be applied in Mary Pickford's case - I'd love to hear your take on this theory! Pickford was a particularly interesting case. She had an enormously popular stock character (the strong-willed, innocent beauty); an equally popular celebrity profile (intertwined with Douglas Fairbanks'); and behind the scenes, a reputation for being a tough negotiator who always knew the numbers. I imagine Pickford chose film projects based their compatibility with all three. But I can't think of a film in which any of them were deliberately subverted, a la THE SEARCHERS or ABOUT SCHMIDT. Maybe STELLA MARIS, but only because she played a physically unattractive (and arguably less marketable) character. I am interested in films that make sense ONLY if you're previously familiar with the actor's public persona. KISS ME, STUPID is a great example, as is NORTH BY NORTHWEST. And no music--which sounds like a good thing in this case. 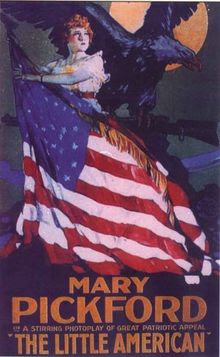 Can you imagine the uproar if those soldiers did attack Mary? There would have been riots! I wish I could have seen DeMille's space film. That would have been crazy I'm sure. Thanks for the post Chris. I haven't had a chance to watch this yet, but now I'm very curious. Thanks for giving us the space to write about Mary, KC. She's underrated by modern film fans, I think. Even silent film fans. Plus, she's a Toronto native, just like me! This film had so much going on! I credit that to DeMille though. It's hard to keep your focus on what could have been a very entertaining little picture. However, I'm one of these silent film fans that thinks Mary can do no wrong and then there's the very talented Jack Holt. A fun contribution to the Blogathon. Pickford was the one great thing in a lot of mediocre films... though SPARROWS and MY BEST GIRL stand out as great films in their own right. I wish they were more celebrated. I really enjoyed this film. I have to disagree about the music though. It was very moving at times and really added to the emotional impact of the darker scenes.